The 10g size has been discontinued. 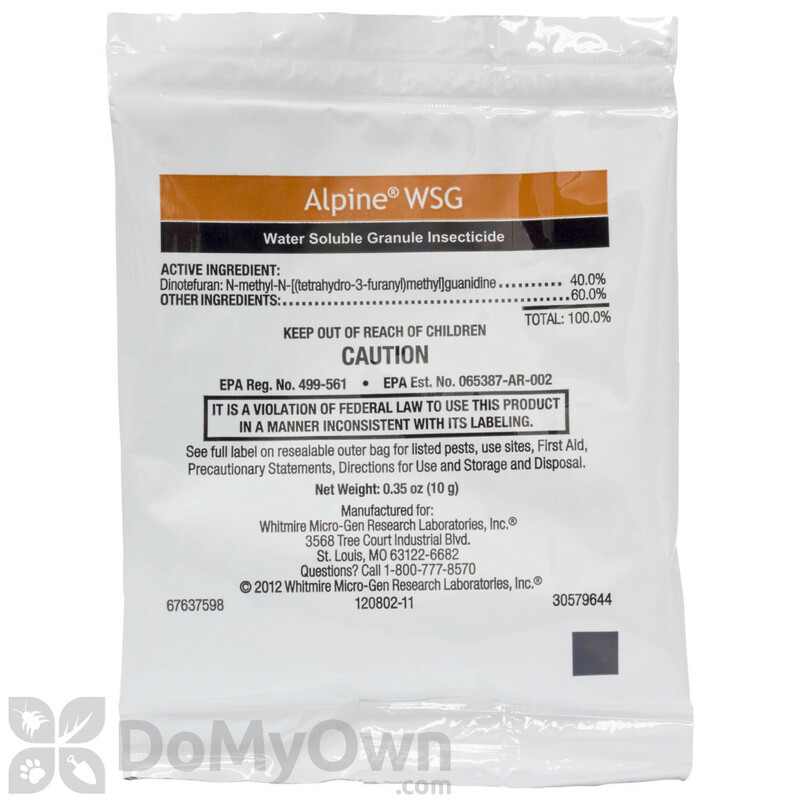 Alpine WSG (water-soluble granule) is a non-pyrethroid, non-repellent broad-spectrum insecticide that uses the active ingredient Dinotefuran. Dinotefuran has been granted Reduced Risk status for public health use by the EPA. Alpine WSG can be used in attics and eaves; on exterior hard surfaces like sidewalks, driveways, patios and porches; on full exterior sides of buildings; indoors as a broadcast interior treatment on carpets, rugs, floors, upholstered furniture, pet beds and resting areas; and off structure as a broadcast application for fleas and ants. 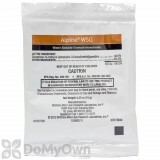 Alpine WSG is effective against a wide range of common insects such as brown marmorated stink bugs, kudzu bugs, ants, fleas, bed bugs, house flies, and German cockroaches. Alpine WSG has residual activity of 30 to 60 days for most applications. Alpine WSG requires no rinsing. The finished solution of Alpine WSG is odorless, non-staining, and does not settle once mixed. Alpine WSG does not clog spraying equipment because it dissolves completely in water. Plastic Jar that contains 500 grams and a Measuring Cup. Tip and Pour Bottle that contains 200 grams. 1 Gallon of finished Solution Treats 1,000 sq. ft. So, been in the pest control industry for 8 years. Ants have really become an issue. When I started years ago, we used Suspend Sc for interior, and Dragnet SFR on exterior for ants. FYI not a good idea using repellents on ants. Switched to a interior phantom/ exterior termidor. It works great, but you are limited to two applications of .06 concentration, or four .03 a year. Had to find something that I could use more often on customers homes who had moisture issues/ conducive conditions. Then I found Alpine WSG. This is the first non repellent that I could use inside and outside, and re apply with minimal restrictions. It truly eliminates ants when used per label. Thank you BASF, for creating something so effective. Very good exterior flea control. It has been awhile since I have seen something work this well. Great product ! Alpine WSG was easiest to use of the several different insecticides we have tried. It dissolved quickly and completely, tank mixed great with other needed chemicals, and is very effective on the bugs we were targeting. We have used it with much success on fleas, mosquitos, and deer flies on different occasions. I used the Alpine WSG alongside the Martins IGR (one gallon) for stubborn flea population in my apartment I inherited (I don't have a pet). Since the flea infestation is so severe, I will need another treatment to be sure the combo worked. However it does look VERY promising as the FLEA BITING HAS STOPPED after just one application. Imagine if I had two gallons instead of the one. I applied this as a general treatment to our new home. The solution is colorless and odorless as promised, which is great, but the efficacy so far is questionable. I applied to the inside basement perimeter, the inside garage perimeter, and the exterior house perimeter where the foundation meets the ground. I have seen some dead bugs since then, which is what I want to see, but it is still common to see critters roaming through the garage and all along the exterior. In my first application, I used the medium strength option (two tablets per gallon). I will try a fresh application soon and use full strength. We have no infestation by any means and I am not clear what a reasonable and realistic expectation is, especially along the outer perimeter, but I would at least like to start seeing dead bugs in the garage if I continue to see live ones. What is the residual of Alpine WSG how long will it last? Alpine WSG has residual acitivity of 30 to 60 days for most applications. Is the finished solution of Alpine WSG a wettable powder? 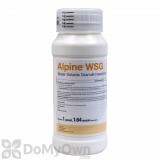 Alpine WSG is a Water Soluble Granule that dries completely clear without any visible residue. What class of insecticide does the active ingredient in Alpine WSG fall into? 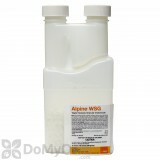 Alpine WSG contains dinotefuran which falls into the neonicotinoid class of insecticides. 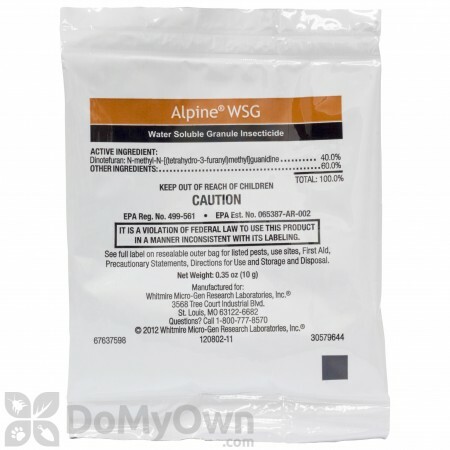 Is Alpine WSG safe for use in a home with children? Yes, you can use Alpine WSG in a home with children as long as children are out of the treatment area until the application is dry. Alpine WSG (water soluble granule) is a non-pyrethroid, non-repellent broad spectrum insecticide that uses the active ingredient Dinotefuran. Dinotefuran has been granted Reduced Risk status for public health use by the EPA. Alpine WSG can be used in attics and eaves; on exterior hard surfaces like sidewalks, driveways, patios and porches; on full exterior sides of buildings; indoors as a broadcast interior treatment on carpets, rugs, floors, upholstered furniture, pet beds and resting areas; and off structure as a broadcast application for fleas and ants. The diluted mixture of Alpine WSG is odorless, non-staining, and does not settle once mixed. How good is Alpine WSG for bed bugs? For how long will it kill them? 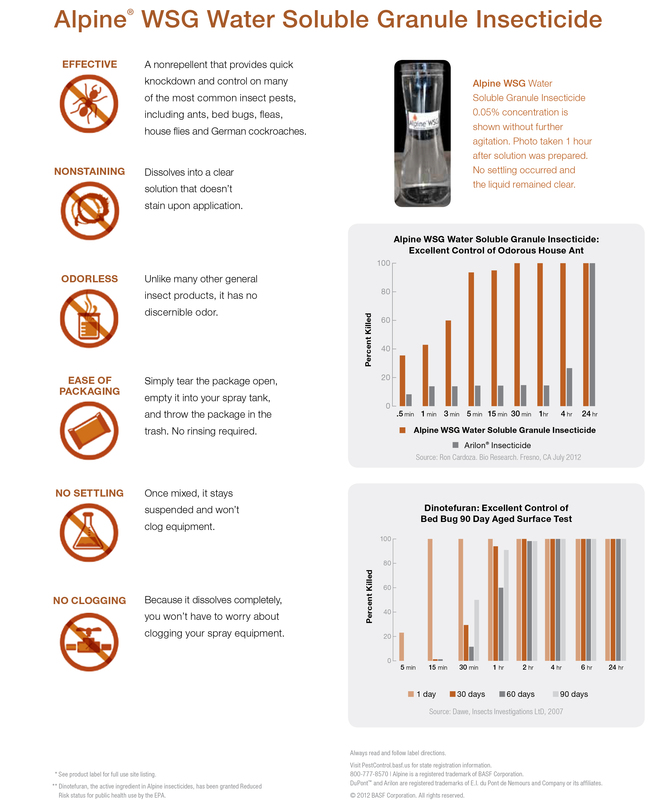 Alpine WSG will kill Bed Bugs that come in contact with the direct spray or with the treated area for 30-60 days. 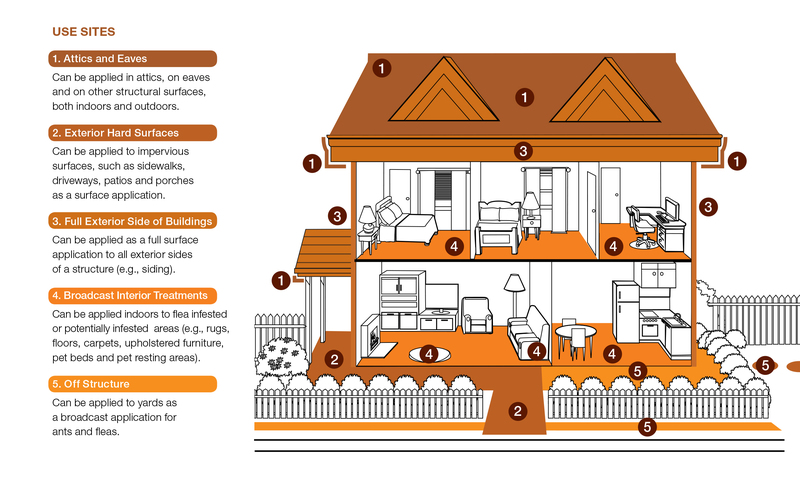 Please keep in mind it really takes more than one product to treat for Bed Bugs. Please be sure to checkout our Bed Bug Guide where you will find the most effective products for bed bug control including Bed Bug Kits.